Dermot Looney, the Labour Party candidate in June's local elections in Tallaght Central, has slammed cutbacks in Dublin Bus routes, claiming they will hit those on low incomes, the elderly and the immobile hardest. He has also sought clarification on whether services local to Greenhills, Tallaght and the Dublin 6w area will be affected under the restructuring of bus routes and frequency. "As a daily bus user for many years I know how important a reliable, well-funded Dublin bus service is to local people – particularly those on low incomes, older people and those who are disabled," said Looney. "The government's decision to cut jobs at Dublin Bus and the ensuing confusion about affected services means those people, who are being hit hardest by the recession in the first place, now face the prospect of being left without bus routes or with reduced services." "I have written to Dublin Bus seeking clarifications on how cutbacks will affect the 15a, 17, 19a, 50, 56a, 77, 77a, 77x, 77n and 150 routes." "We need to ensure that transport services are accessible to all, so I have also asked for a bus shelter to be put in place at the top of 'the Dip' in Greenpark, as well as for one to be re-installed opposite the Cuckoo's Nest in Kilnamanagh. 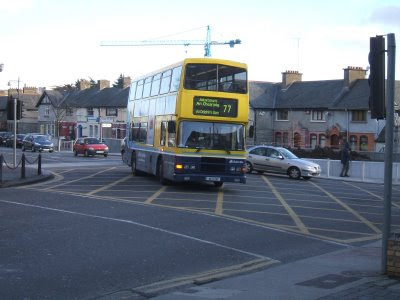 I have also asked Dublin Bus to consider a feeder bus to the Luas line from Greenhills, where so many older people are reliant on public transport." "It is particularly galling for the Green Party Ministers to go along with these cuts. Labour recognises that the social, environmental and economic infrastructure of our local communities is dependent on a stable, well-funded and effective public transport system. Simply put, public transport is the best way to curb vehicle emissions and reduce our carbon footprint." "Perhaps the Greens expect us all to be able to afford hybrid cars, but they and their Fianna Fáil masters are clearly out of touch with working people by carrying through with a slash-and-burn policy at Dublin Bus." "As a Labour candidate, I am committed to a well-funded, effective and affordable Dublin Bus service in public ownership, serving all communities in the Dublin area, and acting in an integrated manner with other public transport services in the region." Dermot Looney, the Labour Party candidate in June's local elections in Tallaght Central, has welcomed the National Youth Council of Ireland's (NYCI) campaign to lower the voting age to 16. 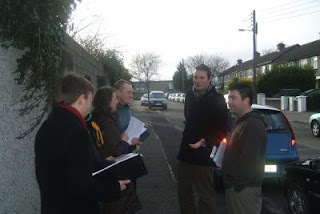 Looney, 26, is the youngest candidate in South Dublin County and had previously launched a similar campaign in June 2008 aimed at reducing the voting age for local and Euro elections. The NYCI campaign puts pressure on Minister for the Environment, John Gormley, who has responsibility for voting legislation and who promised in the Greens' last manifesto to drop the voting age. "16 and 17 year olds have a great deal of experience with the democratic process. The teenagers of this generation have far more knowledge of politics through the CSPE programme in secondary schools. They are increasingly engaged in political and charity campaigns. And they are heavily impacted on by decisions made at local and European level," Looney stated. "Articles 12, 16 and 47 of our Constitution enforce a voting age of 18 and above for Dáil and Presidential elections and referenda," Looney said. "But there is no such constitutional requirement for local and European elections, such as those happening in 12 months time." "As someone who is in contact with young people on a daily basis and in a variety of capacities, I am constantly encouraged by their commitment to social justice, equality and democracy. I am lucky to have a number of committed 16 and 17 year old supporters knocking and doors and campaigning with me – but none of them are permitted to have their say this June. They are politically engaged, politically active and politically aware – but not politically enfranchised." "A great many teenagers are rightly angered by the demonisation of youth by conservative politicians and media outlets. Now's the time for young people to stand up and be counted," stated Looney. I thought some of the regular blog readers - hello there - might like to read about some of the more obvious work of the campaign, so I took the camera with me to Cherryfield this afternoon for a canvass session. 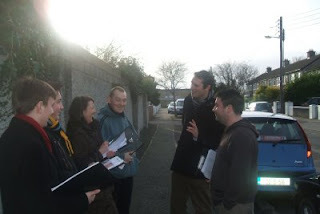 Following a spot of leafleting in Greenpark this morning, we moved to the other end of Dublin 12 for a canvass. Cherryfield and Beechfield are in the Dublin South Central end of the new Tallaght Central ward. Locals are particularly concerned at the overdevelopment at the Ashleaf, the lack of facilities for children and youth, and vandalism, but as you'd expect the over-riding concerns are the same everywhere in the ward - jobs, the economy and education. The reception on the doorsteps was very warm indeed. Having already campaigned heavily in the area, we are trying to ensure our early work pays off. 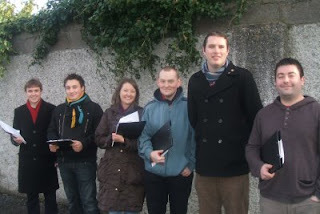 The pictures, taken by Paul Dillon, show myself with some of our campaign team on Beechfield Close. 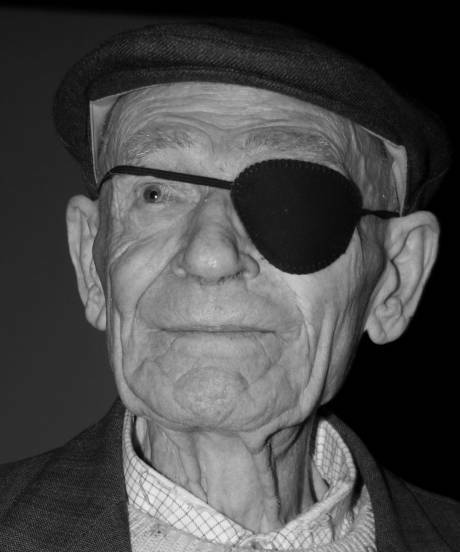 I was deeply saddened to hear this afternoon of the passing of Bob Doyle, the last remaining Irish member of the International Brigades who fought in the Spanish Civil War. I was honoured to meet Bob Doyle when he spoke two years ago when he spoke at Labour Youth's Connolly Festival in the Matt Merrigan Hall at the ATGWU on Abbey Street. It was the largest public meeting Labour Youth had organised in memory - more than 200 people crowded into the room to hear Bob's account of his part in the 'comradeship of heroes' that fought Fascism in defence of the democratically-elected Republic. No one was disappointed. Bob's speech was moving beyond words, an account deeply personal and yet defiantly political. My great honour that night was to be asked to play the meeting out by singing 'Viva La Quinte Brigada,' Christy Moore's classic song which celebrates the Irishmen of the Connolly Column who braved the Francoists in Spain and the far-right hegemony in Ireland, often alienating families and communities as a result. Bob was visibly moved at the rendition and his kind words and firm handshake after the song are what I remember best. It is probably the greatest honour I have ever had in politics and Bob, his writings, his words and his politics will always be part of my political journey. Bob was 92 and died at his home in London. You can read more about Bob's life and tributes paid to him at the Irish Times and Indymedia. 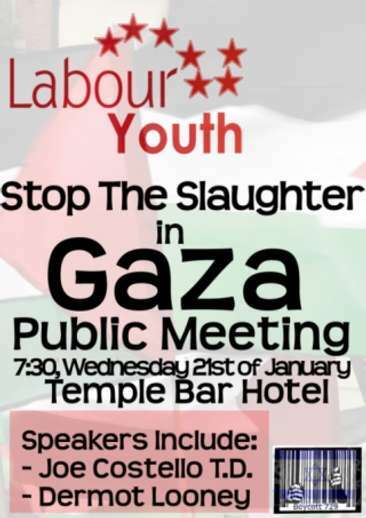 Labour Youth will be hosting an open meeting this Wednesday - tomorrow - to discuss campaigning against the massacre taking place in Gaza. While there is a fragile ceasefire in place, it is vital that Ireland and the international community put pressure on Israel to ensure an end to their beligerent occupation of the West Bank and their blockade of the people of Gaza. The speakers at the meeting will be: Joe Costello T.D., Dermot Looney (Tallaght local elections candidate) and the meeting will be chaired by Maria Parodi (local elections candidate Ringsend). * An end for all US financial and military aid for the Israeli army and government. * An end for all contact between the European Union and Israel including trade until Israel adheres to international law. Meeting a supporter in an old stomping ground. Like the buses you wait an hour for and then three arrive at once, I'm lucky to be back on the airwaves this week not once, not twice, but thrice. I began this evening on Radio Tallaght, a new Community Radio initative broadcasting from the new Rua/Red building beside the Council Offices and the Civic Theatre in Tallaght. Radio Tallaght is run by Tallaght Community Arts, that fine organisation who do so much across the arts in Dublin 24, along with the Tallaght Radio Forum, a group of community radio activists. Having worked for a few months a few years ago in Newstalk - unpaid I hasten to add - and done a few radio shows, I was delighted with the professionalism of the set up. Radio Tallaght will be broadcasting for six weekends this year, and we rounded up the January broadcast with a quiz between local politicians and students. To my mild amusement I was on a team with Fianna Fáil's local TD, Charlie O'Connor, and Fine Gael Cllr for Tallaght South, Karen Warren, competing against three Tallaght IT students. 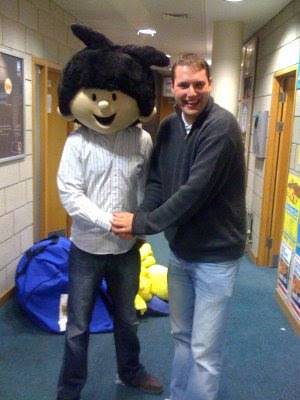 The show was hosted by Eoin Sweeney of RTÉ Radio and Newstalk fame. A number of times he referred to me keeping the red flag flying, a phrase I can be partial to myself, but one which sturck me as unusual from a radio presenter - until I found his profile on the website for the Bread and Roses project, which I suppose brought the 'Red Flag' song back to the Irish left. I'm looking forward to the next broadcast from Radio Tallaght in March, whose diverse programming really shows up a lot of the commercial nonsense we hear on the airwaves. It's the first of three radio programmes for me this week. Tomorrow - Monday - I am speaking about my candidature, the Labour Party, education and the economy on 103.2 Dublin City FM (formerly Anna Livia) from 1.30-2pm on the 'Student Talk' show with two local secondary students. You can hear it online at http://dublincityfm.ie/. And to round up the radio appearances - surely that word can't be right - beidh mé ar Raidió na Life ar oíche Dé Máirt idir 6 agus 7, ag caint faoin feachtas Obama agus an baint a raibh agam leis i Virginia. With Obama's inauguration leading the news, I'll be speaking about my involvement in the Virginia campaign between 6 and 7pm with Paul Mulville. You can tune into it at 106fm or listen live at http://azul.streamguys.com/rnl106 . I've done a lot of analysis lately of local unemployment figures and it makes for some of the most depressing work I've had to do in this campaign. As some of you will know, I did a degree in Social Policy in UCD and have studied all the major texts on unemployment, increasing labour market access, active labour market programmes, etc. But to know that there is a personal story behind each number - a family who've lost their breadwinner, an early school-leaver now listless, an older worker facing the prospect of never being employed again - gives an emotive and heart-rendering bent to the stats that goes beyond the data. I put out a shortened press release on this yesterday - it's available here. But when I was doing it up I ended up with too much information for a standard press release. The papers just wouldn't pick it up. So here it is in all it's glory. It forms the basis of my policy on unemployment and the analysis which will inform me as a Councillor. Dermot Looney, the Labour Party candidate for this year’s local election in Tallaght Central, has called for the strong-arming of youth employment initiatives in light of the latest local increase in local unemployment figures. The release of live register statistics for December saw the national unemployment level creep up towards the 300,000 mark, the highest figure since 1993. Looney noted that the current employment crisis is threatening the social gains made across South West Dublin in recent years, and will hit working-class communities the hardest. At the Tallaght Social Welfare Office, the signing on centre for people across the local community, an unprecedented 6,516 signed on for jobseekers allowance and benefit in December. This was 561 higher than in November, which is the biggest monthly increase in unemployment in Tallaght this decade. Extraordinarily, there has been an increase in the Tallaght office alone of more than 2,500 in just 12 months, due in part to the closure of major companies such as Jacobs (February), Microprint (March) and Tesco’s (April). Looney highlighted the increasing youth unemployment rate as a cause for particular concern. Youth unemployment is defined internationally as those under the age of 25 who are active in the labour force but without a job. There are 1,596 under 25’s signing on in Tallaght in December – a jump of 160 in just a month, and an increase of more than 2/3 on the figure just 12 months before. “The CSO’s most recent statistics on the proportion of young people out of work, last August’s Quarterly National Household Survey, showed a national youth unemployment rate of 16%,” said Looney. Dermot Looney, a Labour Party candidate for next year's local elections to South Dublin County Council, has congratulated local boxer Ken Egan on his receipt of the Honorary Freedom of South Dublin. Looney was the political activist who first made the call for Egan to be granted freedom of the county back in August 2008, following Egan's silver medal success in the Beijing Olympics. Following Looney's call, which received considerable coverage nationally and locally, the members of South Dublin County Council decided to award the freedom to Egan. The ceremony was due to be held in November but was deferred until January 12th, when the Clondalkin boxer was presented with the award by Mayor Marie Corr. "I am delighted that the Council have granted this honour on one of South Dublin's local heroes," noted Looney, "and I am proud to have been the first to make the suggestion which has now become a reality." "As I stated back in August, the best way to honour sporting heroes such as Ken Egan is to build the sporting infrastructure which enables the sportspeople of tomorrow. In terms of its social and health benefits, provision of sports facilities and resources is a key instrument of social policy that Ireland has, in general, failed to enact to its potential. Local Councils and the government need to step up their commitment not only in terms of the money provided, but also its concentration in areas of real need," Looney said. Taken from internal Labour email - if you'd like to attend, please let me know. This month marks the 90th anniversary of the first sitting of Dail Eireann, which was held in the Mansion House on January 21st 1919. This is a hugely important date in the evolution of the Irish state, the first meeting of the first democratic parliament of the Irish people, elected by universal suffrage. Yet its anniversary each year receives relatively little attention compared, for instance, to the Easter Rising. There were no Labour Party TDs in the First Dail. The Party had stood aside in the December 1918 general election, having been told by de Valera that ‘Labour must wait’. However, the influence of the Labour Party was very much felt at the first meeting of the Dail. There were two documents adopted by the Dail at its first session – a formal declaration of Irish Independence and the Democratic Programme. The author of the Democratic Programme was the then Leader of the Labour Party, Tom Johnson. The Democratic Programme outlined a set of values for an independent Ireland that are as relevant today as they were in 1919; values that successive governments have often failed to meet. The Programme contained many of the radical and socialist values which were contained in the 1916 Proclamation, which had been drafted by James Connolly. In order to mark the 90th anniversary of the first sitting of the Dail and the publication of the Democratic Programme and particularly with a view to creating greater public awareness of the Programme, the Labour Party is holding a commemorative event at 2.30pm on Sunday, January 18th, in the Liberty Hall Theatre. The former TD and General Secretary of the Labour Party, Brendan Halligan, will deliver a commemorative lecture while the Party Leader, Eamon Gilmore TD and the Party President, Michael D. Higgins, will also speak. We hope that you will be able to attend this important event. A commemorative pamphlet will be available at the lecture. Liam Fay, a Sunday Times columnist, had a pop in today's paper. Make of it what you will. For me, it's ignorance is only matched by its childishness. A letter of reply awaits. All politics is local but some local politicians must be living on another planet. In an shameless act of self-promotion evidently motivated by forthcoming council elections, Dermot Looney, a Labour candidate, has called for the twinning of his native Tallaght with Gaza city. The Greenhills-based Looney suggested the twinning would constitute a display of “material and infrastructural support from the people of Tallaght and south Dublin council in the time ahead”. We can but hope he at least has some idea what he’s on about. With the economy in turmoil and local authorities strapped for cash, this year’s council elections are likely to be extremely strange. Unable to make credible promises about improving services in their own wards, some of these parish-pump demagogues may well seek publicity by trying to make grandiose interventions in international events. Think global, act local and emigrate before it’s too late. The given version of this speech at the Israeli Embassy was shorter than the text version and spoken without notes. The only significant differences are the brief tribute I paid to Tony Gregory and his human rights record in the given speech which does not appear below, and the fact that I did not get a chance to use the concluding part of the speech in which I quote Chris Hedges. My name is Dermot Looney. I am a Labour Party candidate in next year’s local elections in Tallaght and have been asked to speak to you on behalf of the Labour Party. I would like to give the apologies of our relevant Oireachtas spokespeople, who I understand are attending the funeral of the late Tony Gregory tonight. I want to be brief with you because I know we will have many speakers with different insights to this slaughter. I am here to speak on behalf of and for the Labour Party to express our complete and total solidarity with the Palestinian people. That solidarity is rooted in the membership of the Labour Party, who have at successive Party Conferences and meetings expressed a desire for the self-determination of the Palestinian people and a just peace in the Middle East. And that same solidarity is led by our Party President and Spokesperson on Foreign Affairs, Michael D Higgins, who is a true friend of Palestine and of a just peace, in the face of vicious opposition from Zionists, imperialists and neocons at home and abroad. Let us be clear. The Israeli government, represented in this embassy, have no respect for international law or the most basic of human rights. Their backers in the United States administration have just as little. Both have continually flouted, broken, stymied and undermined the will of the United Nations. And they have done so not just in the past week, with the Israeli invasion of Gaza and the United States’ blocking of a UN resolution which simply called for a ceasefire. They’ve been at it for more than 60 years, right back to UN Resolution 194 in 1948 which called for the right of return. As my party colleague Michael D Higgins has pointed out, the US has armed Israel to a point that has gone well past self defence. It has turned this nuclear-armed state into the greatest prospect for regional and global destruction, as it canvasses for US permission to make a strike against Iran. This latest attack on the people of Gaza has already led to the slaughter of more than 500 people. It is just the latest in years of savage attacks on Palestine, be they bombs from the sky, invasions on foot, the blocking of food, cash and fuel, or any other of the series of Israeli interventions to deprive the Palestinian people of their basic human rights. On behalf of the Labour Party I unreservedly condemn and oppose the attacks on Gaza and call for an immediate and unconditional ceasefire. Such a ceasefire can’t merely be a lull to allow the Israeli war machine pause for breath. Nor can it be a substitute for meaningful talks to resolve the wider issues of which there are too many to name. It is no coincidence that the Israeli elections are scheduled for next month. The actions of the so-called Labour Party Minister for so-called Defence, Ehud Barak, and the Kadima leaders are particularly despicable, and seem to be made to shore up electoral support against the increasingly disgusting Benjamin Netanyahu in opposition. But we stand tonight in solidarity with those Israeli progressives and peace activists in Israel whose voices may seem lonely in the fearful wilderness of today’s Israel. Those progressives and refuseniks are supported not only by justice and right, but by the billions worldwide who stand for peace over war, and oppressed over oppressors. To conclude, friends, let us address where we can best channel our support for the Palestinian people and our opposition to Israeli state terror. We must make clear to the people of Gaza that we in Ireland stand in steadfast solidarity with them. To that end, I propose tonight that my own area of Tallaght be twinned with Gaza City, in a display not just of symbolic solidarity, but of material and infrastructural support from the people of Tallaght and South Dublin Council in the time ahead. Here at home, too, we must pressurise our Government, who talk much about Palestine but do little, to impose sanctions on Israel and to act within the EU to that same goal. As long as Israelis continue to build settlements in the occupied territories and carry out the most heinous military and socioeconomic attacks, no one here can stand idly by or spout the same old platitudes. Like it or not, Hamas is the democratically-elected government in Gaza. It is time that fact is realised by the Israeli government and the so-called Quartet, that totally spineless institution which has done more to destroy the peace process than aid it. To finish, my solidarity, and that of the Labour Party, is entirely on the side of the suffering Palestinian people, entirely on the side of those Israelis who oppose their government’s slaughter, and entirely on the side of a just peace. A journalist called Chris Hedges, who worked for the New York Times in the Middle East, has put it better than I have heard elsewhere. He noted that the Israeli government has said it is engaged in a “war to the bitter end” against Hamas in Gaza. This was picked up in today's Metro - full speech to follow. Dermot Looney, a Labour Party election candidate for South Dublin County Council, has called for the twinning of Tallaght and Gaza City in a speech to Tuesday’s Irish Anti War Movement Demonstration against the Israeli attacks in the occupied Palestinian territories. Looney (26) has a track record of involvement in Palestinian solidarity, particularly within Labour Youth, and has advocated the boycott of Israeli products and services as a campaigning tactic against Israeli state aggression. As part of a new series of occasional guest posts, I am asking members of our campaign to let the readers of this blog know about their motivation for involvement, the work they do and the hopes they have for our campaign for community and change. This week's first guest blog post is from Colm Lawless, Labour Youth's National Secretary who lives in Templeogue. 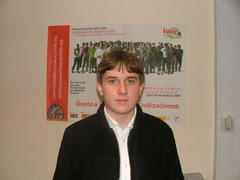 My name is Colm Lawless and I am a Fifth Year secondary school student. I got involved in Dermot’s campaign through local work as a Labour Party member. I first met Dermot at the Labour Party Conference in Wexford in 2007, having previously known him as the Communications Officer of Labour Youth and a strong voice against coalescing with Fine Gael. From there, Dermot announced that he had intentions to run for South Dublin County Council. Having a local young councillor with strong socialist convictions is something that the majority of council wards and boroughs in Ireland do not have, and we are very lucky in Dublin South-West to have just that representation. In an age dominated by corporatism, exploitation and greed it is vital that we have candidates like Dermot who are ready to push the cause for a decent society, based on merit and not means. Since becoming involved in the campaign I have participated in various promoting activities. I am actively involved in leafleting at weekends, distributing leaflets about important local issues and campaigns and highlighting the importance of the community as a means to solve local issues. The issue of the McHugh’s site in Greenhills remains a prominent campaign issue, as people are marginalised without a place to buy their messages or to go to the chemist. We have had huge success as a campaign, which has the youngest team on average in Ireland. We have fought against incompetency and conservatism, and we have fought to ensure that the ordinary people of Greenhills receive a Councillor that is ready to meet the challenges of an ever changing society. I have greatly enjoyed my time so far as a volunteer for Dermot, as I feel that the work we have done has served the community well, and the hope is always that any effort made is an effort made on behalf of the community. Looking into the future, I believe that we can win a seat in Greenhills and change the way South Dublin County Council looks at ordinary residents. It’s time for political representatives to step up to the mark and serve the people that they were elected to serve. I firmly believe that we have that candidate in Dermot Looney, who as a Greenhills resident all his life, has stood up for the rights of ordinary people and has stood up for the cause of socialism. Dermot has always been a diligent campaigner, a diligent worker and will be a diligent Councillor. Our campaign is focused on the principles of equal opportunity and the right to a safe neighbourhood with decent infrastructure. Dermot has been a great source of inspiration to me as a young person, showing how young people can be heard in politics. I have never met a candidate who shares such similar views to my own and who I know will serve South Dublin County Council with the same energy, flair and enthusiasm that I know Dermot for expressing. It has been a pleasure working with the campaign so far, and I look forward to the contest ahead.